AE. 85 Y'rs & 3 M's. & 20 D's. 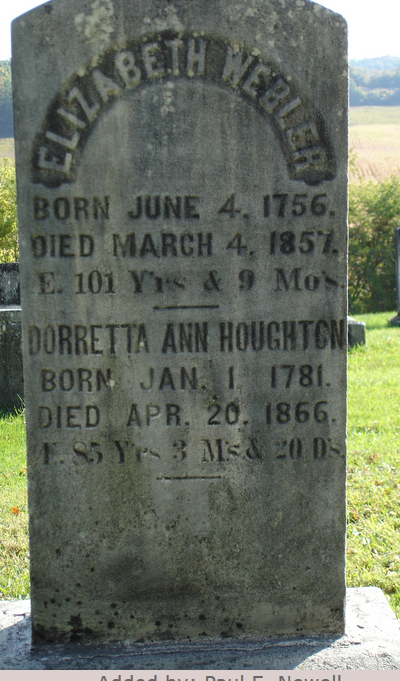 Doretta Ann Webler married Peter Houghton in 1805. Doretta Ann Webler married Daniel Goodspeed in Sep 2, 1849. Daniel Goodspeed married Doretta Ann Webler in Sep 2, 1849. Margit Houghton married Lawrence F. Houghton. Everett C. Clarkson married Dorothy Williams Houghton, daughter of Thomas Francis Houghton Sr and Emily Williams. Emily C. (?) married Wystan Eric Houghton, son of Lawrence F. Houghton and Margit Houghton. Lindy Mary MacKay married Neil Henry Knevitt Houghton, son of Cecil Jasper Henry Houghton and Beryl Irene Somney, in Apr 29, 2000 at Kippford, England. Cecil Jasper Henry Houghton married Beryl Irene Somney. Beryl Irene Somney married Cecil Jasper Henry Houghton, son of Jasper Henry Houghton and Jane Barnsbap. Jane Barnsbap married Henry Houghton, son of Jasper Houghton and Esther Lacey, in Jun, 1863. Henry Houghton married Jane Barnsbap in Jun, 1863. Jasper Houghton married Esther Lacey in Mar 16, 1797 at Frisby-on-the Wreake, Leicestershire, England. Esther Lacey married Jasper Houghton, son of Jasper Houghton and Elizabeth Hatchorne, in Mar 16, 1797 at Frisby-on-the Wreake, Leicestershire, England. Jasper Houghton married Elizabeth Hatchorne. Elizabeth Hatchorne married Jasper Houghton, son of William Holton and Alice Simpson. William Holton married Alice Simpson. Alice Simpson married William Holton, son of Anthony Holton and Mary Reeve. Anthony Holton married Mary Reeve in Nov 20, 1693 at Grimston, England. Mary Reeve married Anthony Holton in Nov 20, 1693 at Grimston, England. Anna (?) married James Houghton. (?) Jette married Armenia A. Houghton, daughter of William Sleigh Houghton and Anna Barker Hopkins, in 1970. (?) Young married Harriet Emma Houghton, daughter of Jehial Houghton and Eliza Smith. Howard L. Houghton married Antoinette Palmer. Antoinette Palmer married Howard L. Houghton. 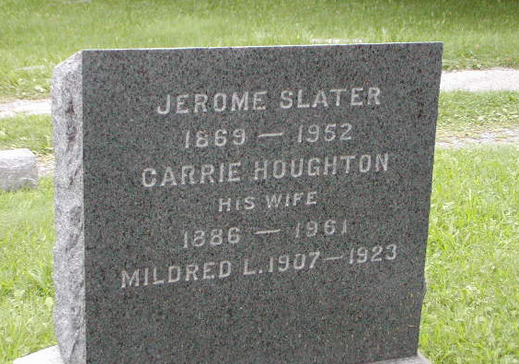 Carrie Houghton married Jerome Slater.